What's inside? Let's start with what's outside: a metallic gold embossed cover with french flaps, featuring the Goddess sisters on the front, and Belldandy and her angel Holy Bell on the interior. Then the contents kick off with a wacky intro to the Oh My Goddess! saga, in the form of an eight-page "fan" manga by Neon Genesis Evangelion Angel designer Yoshitou Asari! Then, four classic Oh My Goddess! stories, each focusing on a different goddess and colorized under Kosuke Fujishima's supervision. 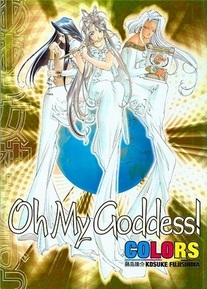 Finally, an "Encyclopedia" section cross-references the people, places, and things of the first thirty volumes of Oh My Goddess, including the differences between the two English versions, and many in-jokes about the series never before revealed!